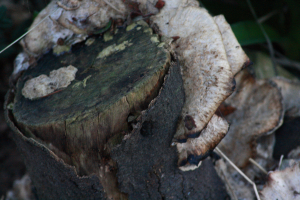 Observation - Fungi on Ceanothus trunk - UK and Ireland. Description: My Ceanothus died some time ago so I cut it down to a stump and planted a new one in front of the stump. This is growing on the old one. Is it poisonous? My Ceanothus died some time ago so I cut it down to a stump and planted a new one in front of the stump. This is growing on the old one. Is it poisonous?